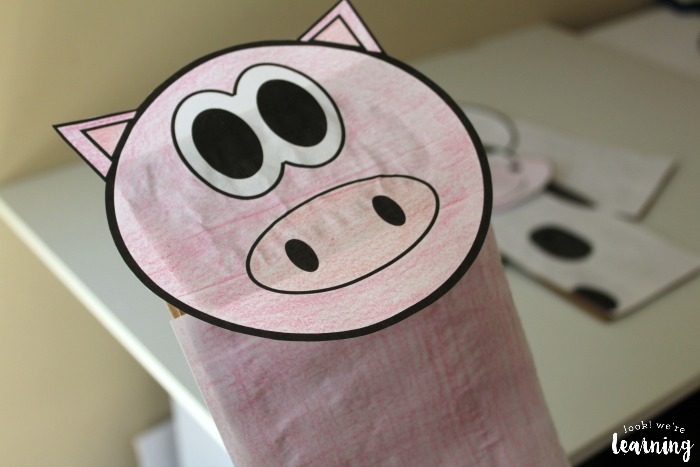 Super Cute Printable Farm Paper Bag Puppets - Look! We're Learning! When my kids were small, they all loved the petting zoo. Between watching the chickens run around, petting the goats and baby lambs, and seeing the pigs root in the mud, there was so much for the kids to see! Our youngest child still loves the petting zoo and she’s not alone! 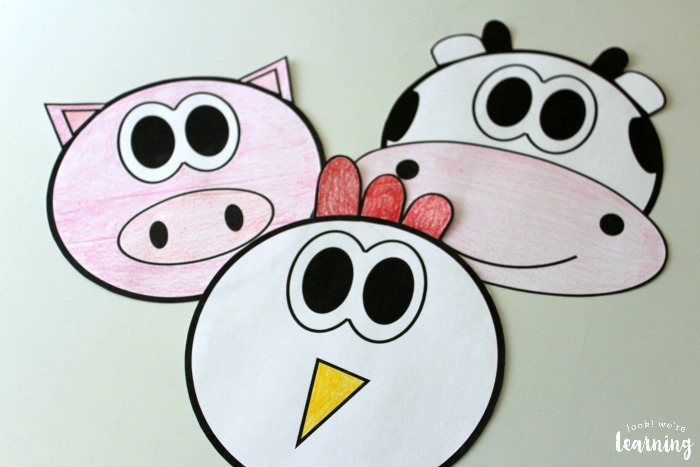 Kids just love farm animals, which is why farms are such a popular topic for early childhood education units. This year, our youngest child is working on reading more picture books and we started with the book Big Red Barn. 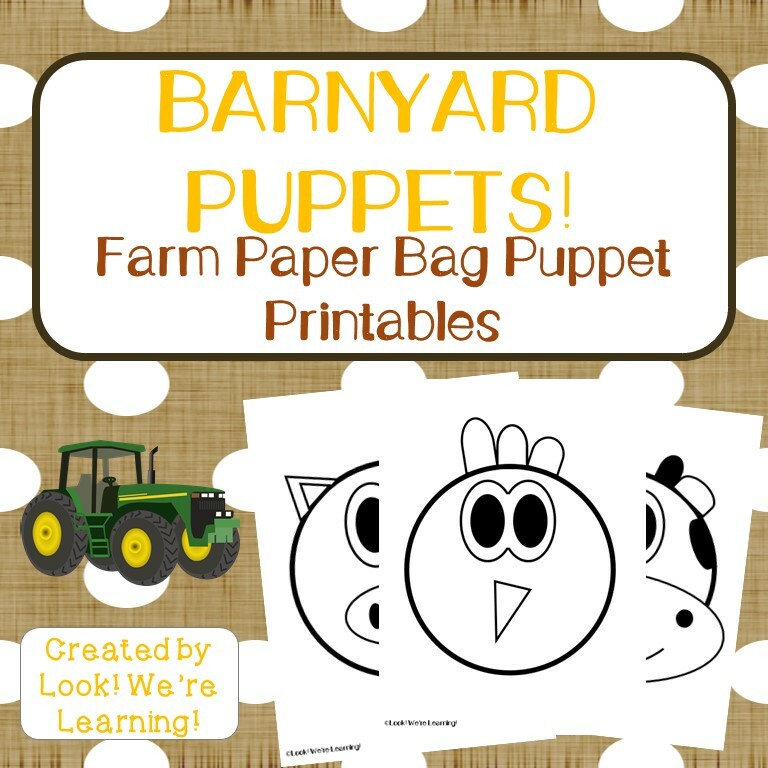 To help her with learning to recite stories, I made up some printable farm paper bag puppets so she could reenact parts of the story. And I’m sharing them with all of you today! 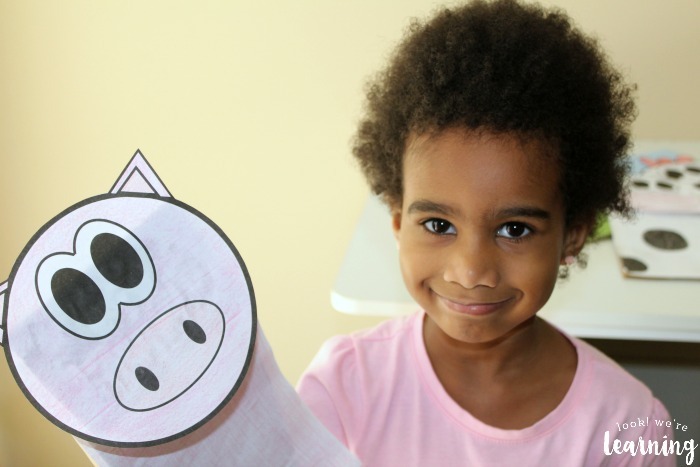 Read on to see how you can get these cute puppet printables free! 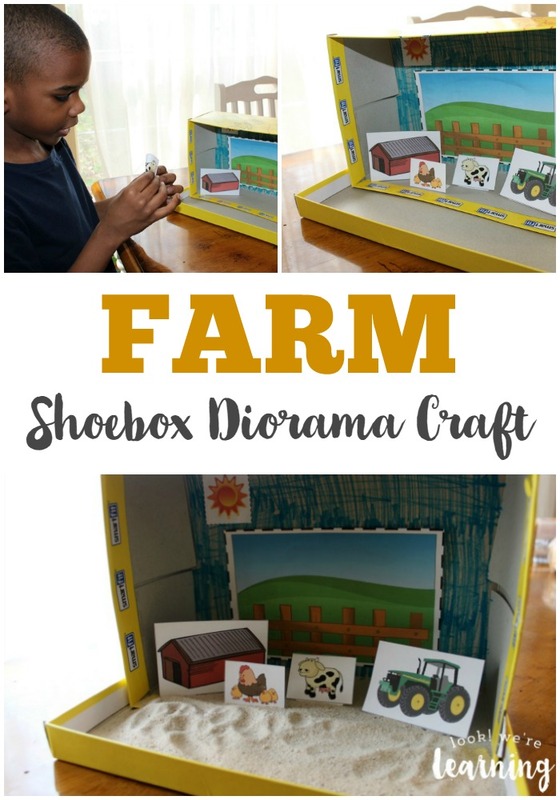 And if you want to share more farm activities with the kids, try our farm animal flashcards or our easy farm shoebox diorama craft! 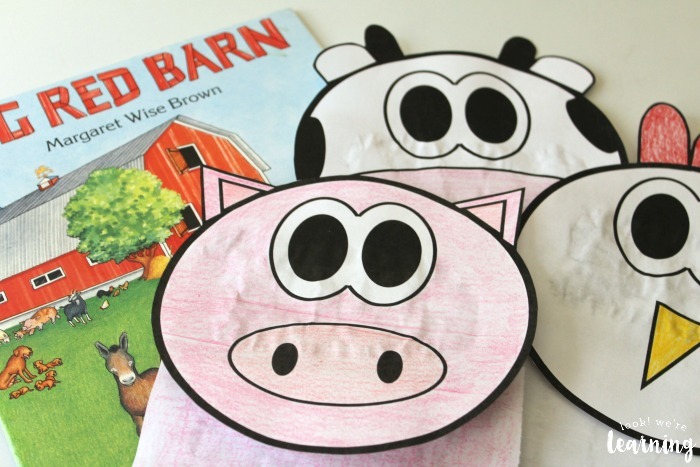 Pick up a copy of Big Red Barn by Margaret Wise Brown to make this a storytime activity! 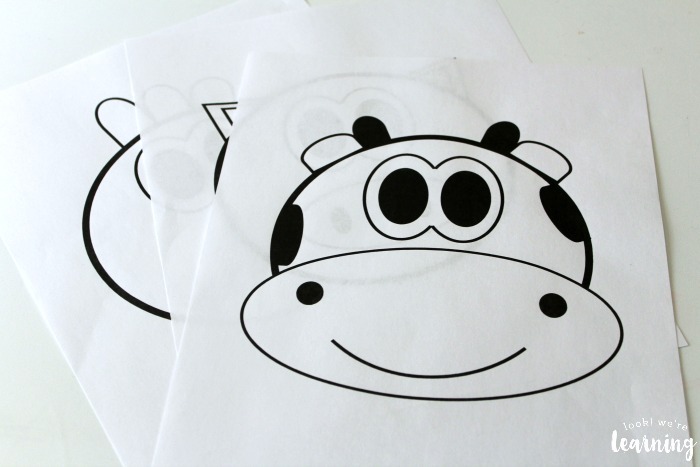 First, you’ll need to print the paper bag puppet faces out. 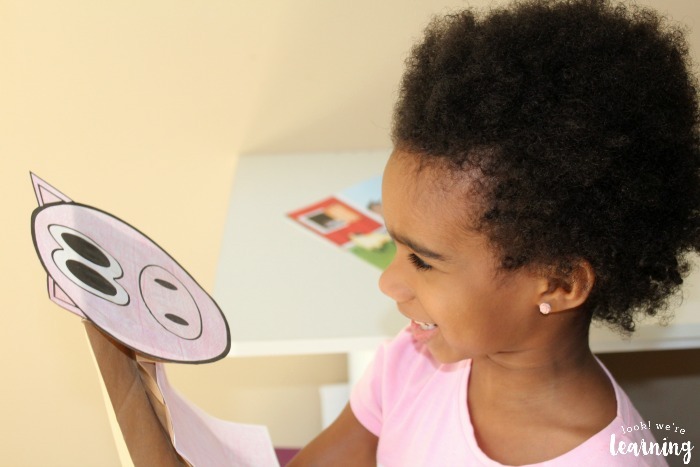 After you color in the puppet faces, use a pair of child-safe scissors to cut them out as one piece each. 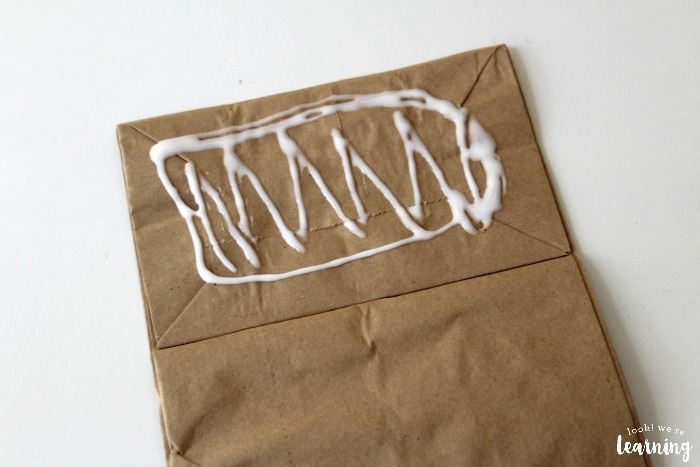 Flip a paper bag upside down so that the bottom is at the top. Leave it folded. Then spread liquid glue over the folded bottom. That’s where you’ll paste the puppet face. 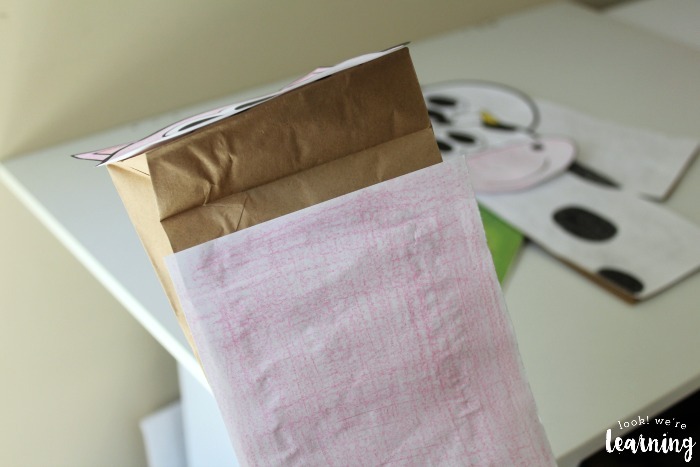 Stick the puppet face on the bag bottom and hold it down to glue it securely. Cut another piece of printer paper in half and color it to match the puppet face. 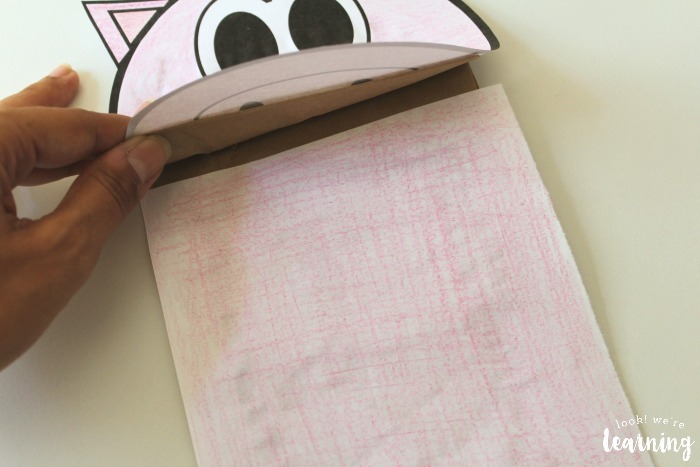 Then glue it onto the paper bag body directly under the puppet face. Be sure to flip the bottom up so that you can fit the paper onto the bag. When you’re done, the puppet should look like this. 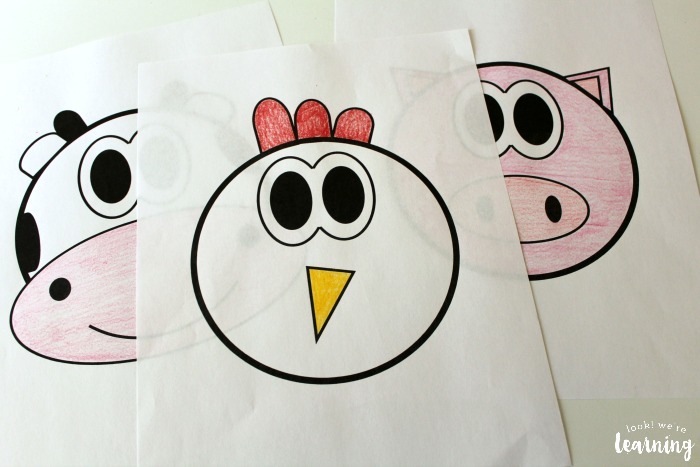 Repeat the process with the other puppet printables to make a cow puppet, a chicken puppet, and a pig puppet. Since we were reading Big Red Barn, we wanted to make one of each. 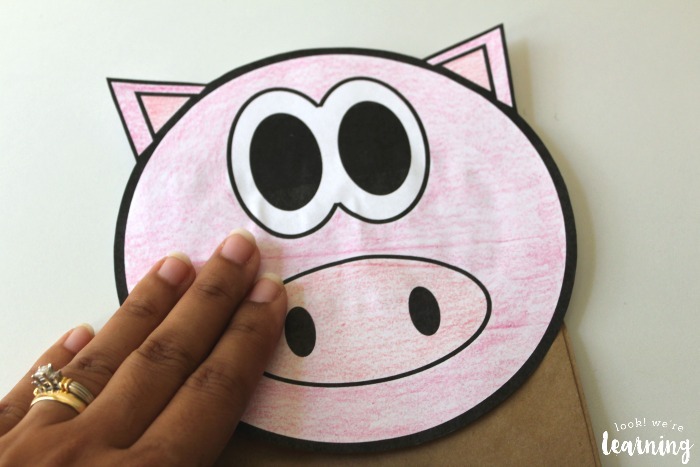 But you could also print three pig puppets to go along with The Three Little Pigs or print several cow puppets to go with Click, Clack, Moo. 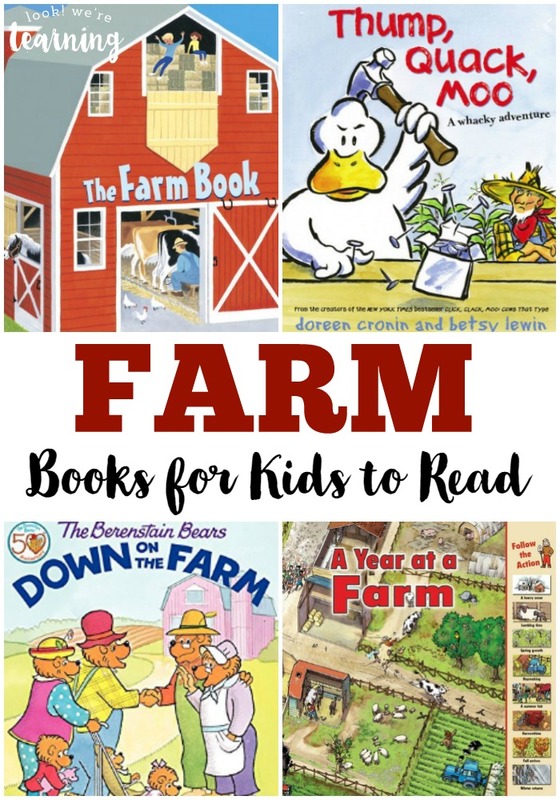 There are plenty of great children’s books about farms to use these with! 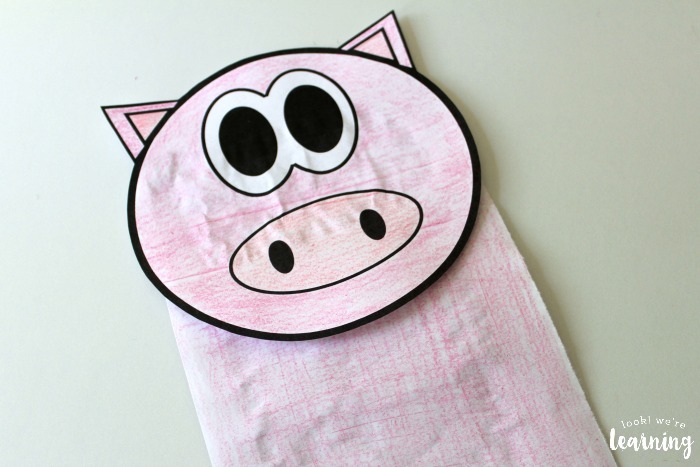 To make your puppets “talk”, just have the kids put their hands inside the bags and place their fingers into the folded bag bottom (the same place where the face is). They can move their fingers up and down to make each puppet speak! Using lunch bags is the easiest way to make sure that the bags will fit your little ones’ hands. But if you want to make adult puppets, you might want to get bags that a little bit bigger. These were so much fun for storytelling! And they’re great for pretend play too! 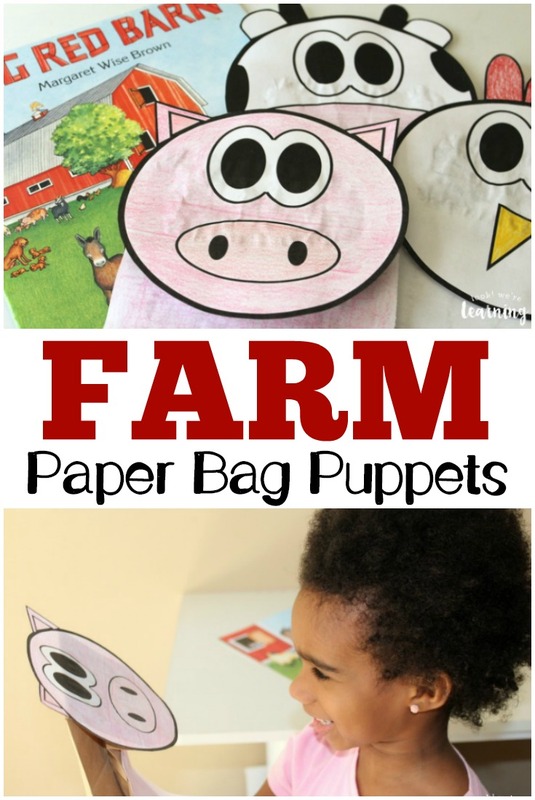 Scroll down to get your copy of our Printable Farm Paper Bag Puppets free! 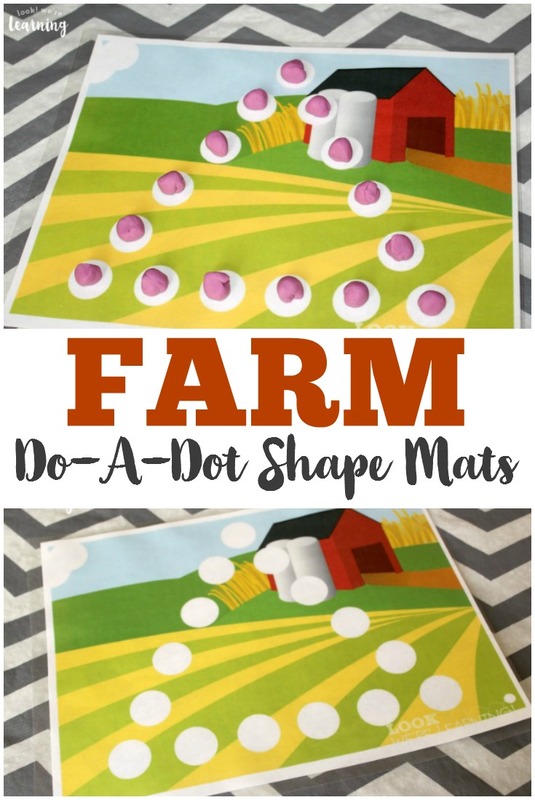 Have even more farm fun with the kids! 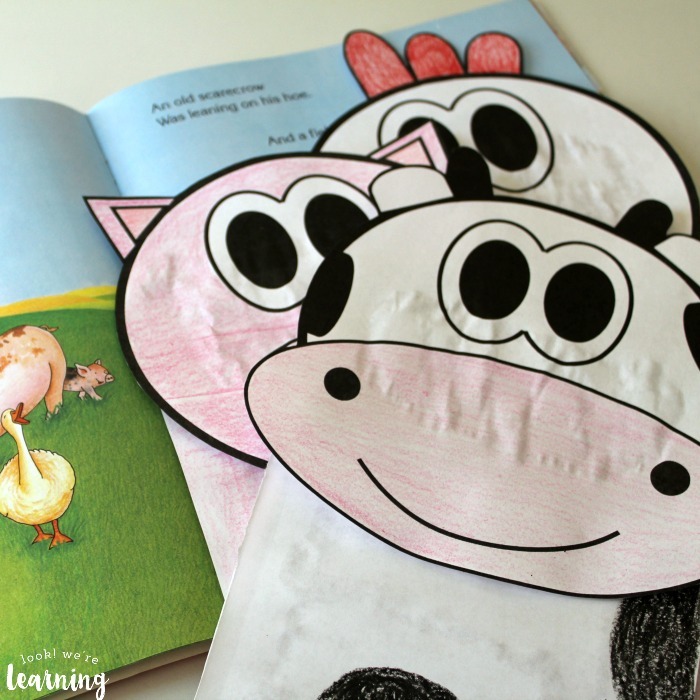 See even more ideas for early learners on my Learning for Little Ones Pinterest board! This post is part of the 31 Days of ABC’s linkup! It’s time again for another fantastic month of alphabet fun with the 31 Days of ABC! All this month you can look forward to 31 more days of activities, crafts, books, apps, and more, all dedicated to teaching young children the alphabet. I am so happy to be working with an amazing group of kid bloggers, who will be sharing their ideas with us in the coming days. So join us as we jump, skip, hop, and read our way through the alphabet this October! Find more great resources in our series from past years: 31 Days of ABCs 2013, 2014, and 2016!